Download, Install and Run Outlook PST Repair software in your operating system. Then click on 'Select Outlook File' to choose the PST file to work on or you can find the specific PST file as well. 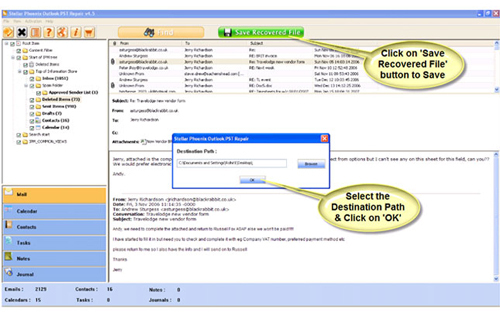 As you have selected your PST file click on ‘Start’ button you allow the scanning process. 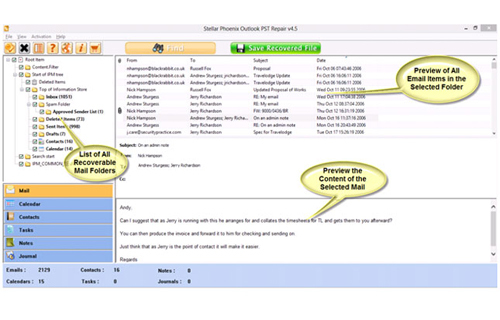 When the scanning process is completed, the entire recovered mailbox folder and other items will be listed on the left pane. You can select any item you want. After selecting all or some of the items click on 'Save Recovered File' button to recover the stuffs on the designated location on PC. When the saving process completes, a dialog box will confirm the process and show the 'Destination path' and 'Recovered File Size'.